Japanese artist Ryoichi Kurokawa is holding his first solo exhibition in the UK next year at Liverpool’s new media gallery, FACT. Part of the exhibition will include a new work called unfold, a screen-based immersive audiovisual piece that transports viewers into space, offering glimpses of cosmic happenings like the birth of stars and solar systems, based on scientific data. Kurokawa uses data gathered by astrophysicists at the Research Institute in the Fundamental Laws of the Universe (CEA, France). 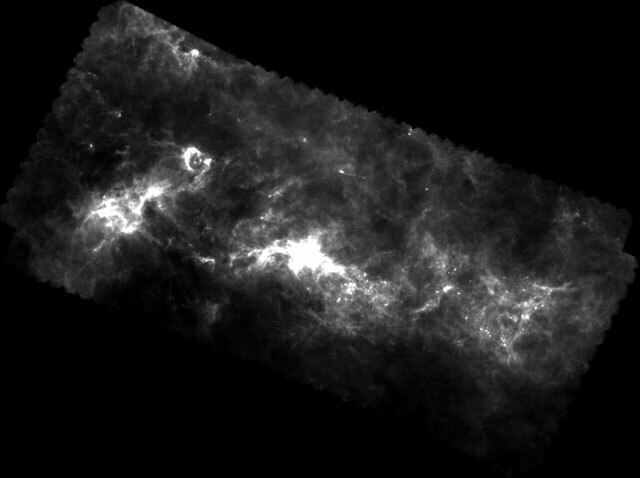 The data has been collected from molecular clouds—places of interstellar germination where hydrogen and other molecules are formed—also known as stellar nurseries, as stars can be born within them. “Kurokawa will construct his vision of a molecular cloud as close as possible to the scientific truth using striking 3D representations of space, combined with interpretations of how stars form within the cloud and create star clusters,” says the exhibition’s Kickstarter campaign. Kurokawa, his studio, and FACT are looking to finance the last 10% of the exhibition on Kickstarter, hoping to raise £5,000. The Kickstarter has eight days to go, you can go here if you want to donate. The rewards for donating include limited edition prints of unfold for the smaller donations, all the way up to exhibition tours of the new show with the curator, and priority tickets to a Kurokawa performance. The campaign follows one from the Royal Academy earlier this year which raised over £100,000 on Kickstarter for an Ai Weiwei public art work. Click here to visit the unfold Kickstarter, and here to learn more about the artist.